The hamadryas baboon (Papio hamadryas) is a species of baboon from the Old World monkey family. It is the northernmost of all the baboons. 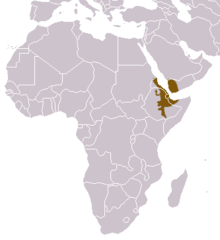 It lives in the Horn of Africa and the southwestern tip of the Arabian Peninsula. These regions have fewer natural predators than central or southern Africa, where other baboons live. The hamadryas baboon was a sacred animal in ancient Egypt. ↑ Gippoliti, S.; Ehardt, T. (2008). "Papio hamadryas". The IUCN Red List of Threatened Species 2008: e.T16019A5354647. doi:10.2305/IUCN.UK.2008.RLTS.T16019A5354647.en. http://www.iucnredlist.org/details/16019/0. Retrieved 12 January 2018. ↑ Linnaeus, Carl (1758). Systema naturæ. Regnum animale (10th ed.). p. 27. Retrieved 19 November 2012. This page was last changed on 13 November 2018, at 15:23.